The Agile Manifesto , as shown in Figure 6, guides teams in a direction of improving communication and involvement and eliminating waste from their process. It is a good idea to hang it on a wall in everyone’s sight and use it whenever decisions on the process are made. 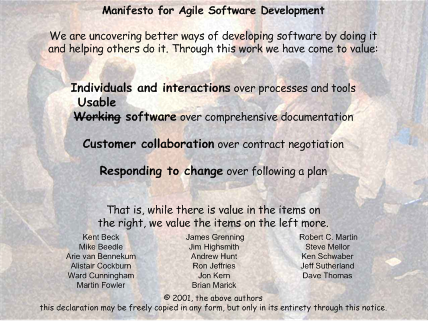 We changed the second statement from the Agile Manifesto a bit to make it more widely usable. 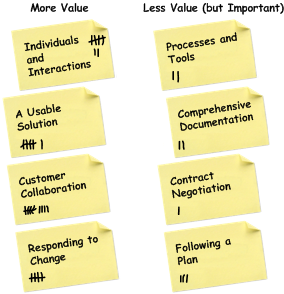 After all marks have been given, rearrange the sticky notes according to the Agile Manifesto and check if the team values the aspects on the left more than the ones on the right. We have not experienced a team that valued an item on the right more than its counterpart on the left so it is a nice common starting point. The result might look something like Figure 7. The next question is: which aspects receive the most attention your organization? Prepare to be surprised by the discussion to follow. 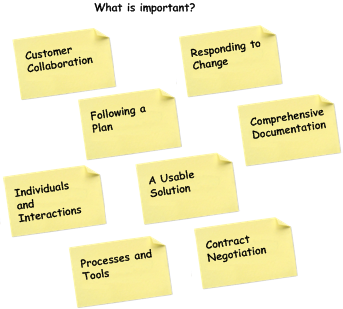 Agile also has 12 principles communicating the mindset teams and organizations need, to be able to leverage the advantages Agile has to offer. We will not discuss all 12 principles but they are partly incorporated in an upcoming post discussing Unified Principles for Iterative and Agile IT Development.